Time to go home. After the traffic delays getting from the airport to the hotel, I decided to take the train back to the airport. It took a taxi ride to Tokyo Station and a not too short line to buy a train ticket (the Narita Express). After 10 very disorienting minutes where I couldn't figure out how to get to my platform (it's a big place! ), I managed to find the right track and ask someone where to stand (the tickets have reserved seats). After that, the hour long train ride was very relaxing. At the airport, I noticed that at the next counter there was a little girl dressed up like the English rapper, Lady Sovereign, with the side pony tail, the big round ring, a purple sweatshirt, jeans and gym shoes. She was pulling several pairs of gym shoes from one bag and putting it into another. (By the way, I know next to nothing about Lady Sovereign, except that she looks like this.) That's funny, I thought, she's not even that famous. Then it occurs to me that 12 year old girls dressed up as their favorite rapper are rarely 20-something year-old young women with lots of makeup on, traveling to London on BA with their posse, meeting their personal airline representative after ticketing. Yeah, I dozed off on that train ride, why do you ask? After getting my boarding pass and returning my cell phone, I had some time for shopping. 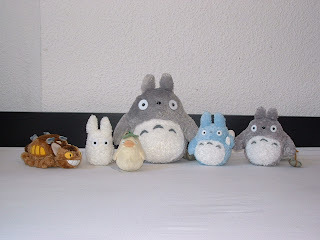 I'd bought some sweets to bring to work in Ginza the day before, but I was looking for some adorable Studio Ghibli stuffed animals to give to my friends' kids in Germany (okay, and a couple for me too). Jackpot. And luckily it cost basically what I had left in cash. I took a picture of all of them when I got home (I haven't had a chance to give out the presents yet, but I don't think 3 year olds read blogs, so I'm not ruining anything). But now I had my shoulder bag and a little shopping bag. Heathrow still only allows one item per flyer. While a little shopping bag would probably pass muster, I really wasn't interested in taking that chance. But my shopping bag wouldn't fit into my shoulder bag or vice versa. I did have, however, a coat with 5 zippered pockets. That's right, I shoved stuffed animals into my pockets (it was even funnier when I arrived in Dusseldorf and it was cold and I put the coat on). After a one hour nap on the plane and a layover in London, the trip was now running 21 hours and I still needed to get to Bonn from Dusseldorf at 10pm. 10pm at night means it's way too late to buy a train ticket from a human in Germany, so I was stuck trying to get the ticket machine to work at the airport as the minutes ticked down to the one train per hour leaving the airport. I just made it, but I needed to change trains at the Dusseldorf Hauptbahnhof before arriving in Bonn, walking home and falling into bed. This is what I've noticed about train tickets in Germany. In the U.S., you'd expect that your ticket would say, what train(s) you're riding, what time(s) the train(s) is(are), where you're traveling from and your destination, at what stop(s) you are switching trains, and maybe the platform(s). This is what my ticket (at 10pm at night after 21 hours of traveling) read: today's date, where I was traveling (Dusseldorf Airport) from and my final destination (Bonn Hauptbahnhof), and how much I paid. Fantastic. So that's it (mostly). From Germany to Japan and back again. After most vacations -- even if I really liked them -- I'd think to myself that now I can cross that place off my list because there are plenty of places I haven't been to yet. But that was definitely the best vacation I've ever had and by midway through, all any of us could think say to ourselves was "I have to come back here." So thanks gang, thanks Takemi and Kumiko, thanks Meg, and thanks Japan. See you next time around. Awww! I wish I bought myself a Totoro too. That turtle is kinda creepy. Erin - Turtle? You don't mean Catbus, do you? You really need to watch My Neighbor Totoro.